The Java String.format method is one of the Java String Method which is used to return a formatted string using the user specified format and arguments. In this article we will show you, How to write Java String format method with example. Before we get into the example, let us see the basic syntax of the string.format in Java Programming language is as shown below. The Java Programming Language provides two different methods to format the given string. Following method accepts two parameters: first parameter is the format you want to apply, and second is the arguments referenced by the format specifier. The following string.format java method accepts three parameters: first parameter is the locale you want to apply, second parameter is the format you want to apply. The third argument is the arguments referenced by the format specifier. Locale: This is the locale you want to apply during the formatting. If the locale is NULL then no localization is applied. Format: Please specify the format string. For example, %d, %f, %s etc. Args: Arguments referenced by the format specifier in Format. If we specify more arguments than the format specifier, the extra arguments will be ignored. TIP: If you omit Locale argument then String.format in Java will take the system default localization. When the format specifier is incompatible with the given arguments. If we specify insufficient arguments. NullPointerException: If the format is NULL. The Java String.format method is used to format the given object using the user specified format. In this Java program, We are going to the same. Following string.format java statement will call the public static String format (String format, Object.. args) method to format the user specified double value to float. The following format statement will format 9876 value to positive integer. Below statement will format 2406 value to Negative integer. 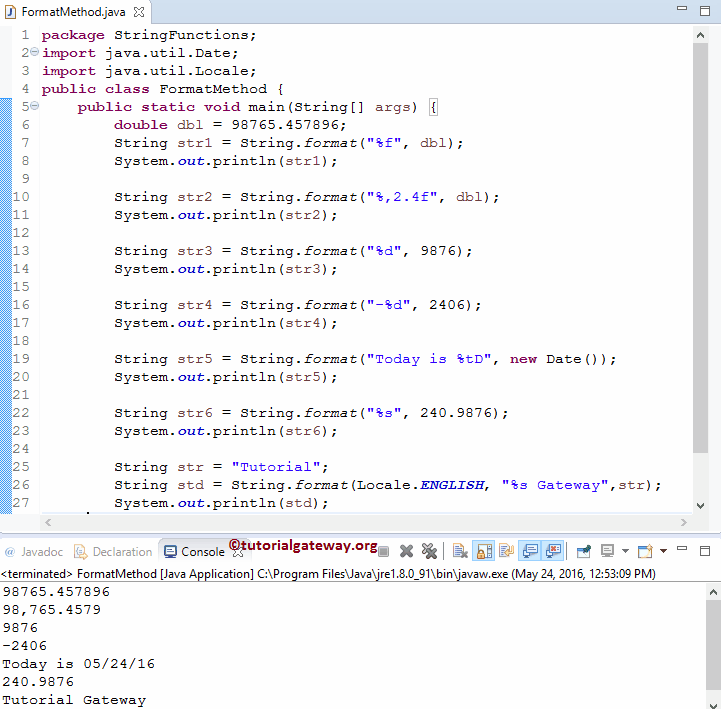 Following java string.format statement will format 240.9876 value to String data. The following statement will call the public static String format (locale l, String format, Object.. args) method to format the string data using user specified local (i.e., ENGLISH) here.